Lady Lane is a rather spooky back road in Swindon, which has been closed to traffic for a number of years and is being gradually taken over by nature. I recently discovered there what appears to be the very large mark of a horseshoe (see photo - size 9 foot for scale). 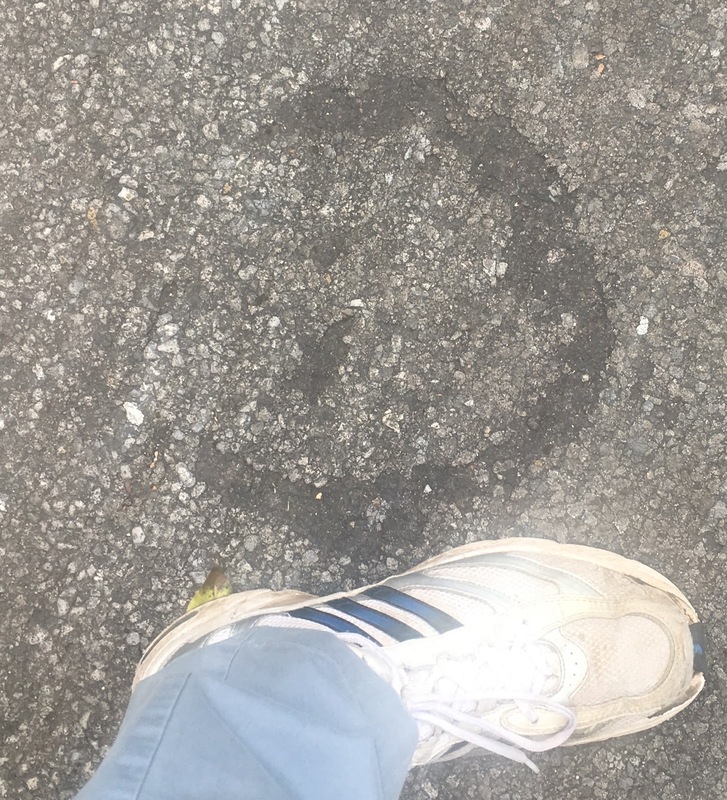 There is something odd about this horseshoe print. The mark is at 90 degrees to the roadway. It has to be a rear hoof, as it's too close to the edge of the road behind it to be a front one. But one step forward would take a cart horse into the high hedge in front of it. But what if it's something very different? The other side of the hedge, straight in the direction in which the horse appears to have been heading, is the ruin of Blunsdon Abbey. The old house burned down around the end of the nineteenth century. So a picture starts to emerge. Back when an abbey that was later converted into a house was still a religious site, chances are they would have had some heavy horses for agricultural work. Could it be that the ghost of a monk from the abbey rides towards the site of the burning building, into his ghostly future of the nineteenth century to then leave a mark in the present? In the monk's time there would have been no hedge. Perhaps the ghost was on a futile mission to save the inhabitants of the burning building. In reality, I don't believe in ghosts - but I am fascinated by the psychology and sociology of ghost stories and alleged hauntings. And my suspicion is that many ghost stories emerge from small oddities, coincidences and cherry picking of evidence. Walking down spooky Lady Lane in the dusk, it wouldn't be too hard to put the pieces together as I did in the previous paragraph and perhaps to imagine a ghostly presence associated with this mark. I'll leave you with the closest thing, perhaps, there is to a real ghost of Lady Lane: my old dog Goldie, no longer with us, walking down the deserted roadway.